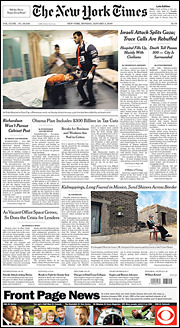 New York Times is now selling ads on their front page. I have to say that I didn’t even notice. This is the reason why it’s a failed strategy. Trend is away from print to online and that is where the NYTimes should be focused. Not only are web users not clicking on display ads, a new crop of software led by Adblocker Plus is blocking all the ads. Adblocker Plus used on about 10% of all web users is quietly gaining ground as a tool for end users. I wonder if the New York Times will see the impact of the fact that display ads are being blocked. The New York Times unveiled a display ad on its front page, despite decades of fear that advertising there could contaminate the journalistic product or brand. Today’s ad, which promotes CBS, occupies a strip of real estate two and a half inches high at the very bottom of page A1. Today’s ad, which promotes CBS, occupies a strip of real estate two and a half inches high at the very bottom of page A1. That makes the unit less noticeable than the boxes available on the front of Rupert Murdoch’s Wall Street Journal, but it’s still a big departure for the Times. In a statement this morning, the Times pitched the turnabout as win for marketers. “In 2006 we began testing ads on some section fronts and received a very positive response from the advertising community,” said Denise Warren, senior VP-chief advertising officer for the New York Times Media Group. In a funny way, the awful business environment may have actually freed the business side to sell the ads without worrying about an outcry from the newsroom. Many other papers have already made their peace with front-page advertising. The Journal began selling front-page units in 2006, carefully milking their potential to get big commitments from the five marketers allowed to buy them each year. With such prominent ad units, of course, it’s easy to wonder how the big articles next to them hurt or enhance their effectiveness. General Motors and Hewlett-Packard ads have bumped up against negative coverage of their own companies. Since then, of course, the economy has worsened dramatically. The Washington Post Co. saw print-ad revenue at its newspapers fall 14% in the third quarter. Silicon Valley Technology Blog – John Furrier Blog at WordPress.com.